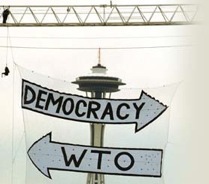 CAGJ is a volunteer led, membership-based organization founded in 2001 by Seattle-area activists who helped to organize the historic shutdown of the World Trade Organization meeting in 1999. We strive to carry on the protests’ legacy of effective and creative collective action for global justice, working in solidarity with the powerful social movements of the Global South who continue to inspire us with their growing resistance to the corporate-driven economic model. Our mission is to educate and mobilize with individuals and organizations to strengthen local economies everywhere. We are grassroots, community-based and committed to anti-oppressive organizing as we build solidarity across diverse movements. Focusing on the food system, we seek to transform unjust trade and agricultural policies and practices imposed by corporations, governments and other institutions while creating and supporting alternatives that embody social justice, sustainability, diversity and grassroots democracy. CAGJ’s Organizing Director will lead two areas: organizational development (through member and volunteer recruitment and engagement) and communications. Responsibilities will be shared with the Executive Director in the areas of fundraising, partner relations, strategic planning and administration. The Organizing Director will also provide program support in the area suited to their experience and interests. Work with Membership Committee to develop and implement volunteer recruitment plan. Provide support to volunteers, including leadership, through training, meeting and event planning, facilitation, workplanning. Identify priorities and carry out plan to meet goal of growing and engaging CAGJ’s membership. Coordinate recruitment, placement and support of interns. Oversee conversion to new database (Civi CRM) and system maintenance and updates. Coordinate and strengthen communications and social media, including website, email accounts, Facebook, Twitter, newsletter, list-servs, etc. Support fundraising programs, including sustainers and grants. Familiarity with and demonstrated commitment to food justice and food sovereignty movements in US and Global South. Familiarity with current issues related to food justice (ie. the Farm Bill, GMOs, Food Worker’s Rights, etc). At least two years experience (volunteer or paid) working with grassroots, volunteer-based, community organizations. Demonstrated ability to effectively engage volunteers in organizing for social justice. Proven ability to work collaboratively with others, in a shared leadership role. Knowledge of organizational development frameworks for grassroots, movement-based organizations. Experience with grassroots fundraising, for example events, major donors, sustainers. Familiarity with managing databases (knowledge of Civi CRM a plus). Familiarity with wordpress, document sharing and collaboration tools such as Google Drive, presentation tools such as Powerpoint or Prezi. Experience using social media as an organizing tool. Strong interpersonal skills, sound judgment, self-motivated and ability to motivate others. Strong organizational skills and ability to track multiple projects simultaneously. Experience with public speaking a plus. Ability to work some evenings and week-ends required. Compensation and Start Date: This position is part-time, and will offer a competitive salary based on experience. It begins January 6, 2014. CAGJ is an equal opportunity/affirmative action employer. People of color, women, queer folks, and people with disabilities are encouraged to apply. How to apply: Please submit resume, cover letter and 3 references by 5pm November 15, 2013 to contact_us@cagj.org.